200 Book Bloggers: contact information, reading preferences, turnaround time, posting policies and more! 40 Blog Tour Organizers that can help manage your tour: contact information, pricing, additional services. 32 review businesses that reach retailers, librarians and readers: contact information, pricing, and policy overviews. Includes a quick start guide, outreach checklists, sample email template, and a guide to professional book design standards. Everything you need to immediately begin soliciting book reviews. 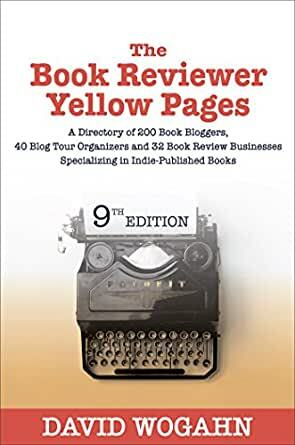 The Book Reviewer Yellow Pages is the only comprehensive source of influential book reviewer profiles and book review guidance available to authors, small publishers, and publicists. This book contains the time-tested guidance you need to zero-in on the reviewers who will be interested in your indie or self-published book. 4.0 out of 5 starsA Very Useful Resource. Subtitled ‘A Promotional Reference Guide for Authors and Small Publishers’, this extensive reference guide is full of information and helpful advice. It’s essentially a listing of websites, blogs, service providers and organisations involved in the promotion of books. As the subtitle makes clear, it’s of special relevance to the self-published author and the small independent publisher. The book lists book bloggers, providing vital information for authors wanting to approach such valuable individuals for reviews. It gives advice on approach and even provides a log that can be used to ensure contact with these valuable people can be made as professionally as possible. Next, blog tour operators are listed. Some of these charge for their services, but some don’t. Again, really down-to-earth information and advice ensures writers will approach these resources in an informed manner. Review businesses are also listed. These are organisations writers pay to review their books. Again, details of the services, charges, and possible outcomes are provided. I’ve never used such a service, but they are popular with a lot of writers. The last part of the book is the Resources chapter, which provides great advice on a number of relevant aspects of both seeking reviews and producing books fit for review. There’s a particularly well-written piece by Terri Rider on book cover and interior design to make the book look as professional as possible. Worth buying this book for that item alone in my view. There’s an extensive index to help authors select the most appropriate reviewers for their work. And there are links to various different websites and organisations. One takes you to the BISAC site, where you can discover the extensive list of book categories as used by the professional publishing industry, so you can list your book under the most appropriate categories. It took me a couple of hours to digest the editorial matter in this book. The pieces on individual reviewers and organisations will take longer to explore, of course. But that activity’s best reserved for the time it’s actually needed. But the book does also stress the need to be prepared well in advance of launch, so the advice is to think about the potential for reviews well before the book goes into production. A very worthwhile reference for all self-publishing writers and those wonderful small publishers who lighten the load for those of us lucky enough to attract their attention. There are some great places on here to get reviews. I've even used these places to ask about reviewing positions, killing two birds with one stone etc. However, like with any book time goes on and sites that once were lively are now dead and gone, but that's not the author's fault. They can't update the book every time a site goes dark. Straight to the point. A useful list of resources for getting book reviews with simple instructions for use. No complicated methods to learn - just simple outreach and pitching. A very helpful resource for new authors or any author who is looking to find reviewers for their books. Easy to use reference material for self-published authors in particular. A reservoir of information. So far, I haven't seen anything else that comes close. 5.0 out of 5 starsGreat Tool! A must have for any new self published author! When you need to obtain reviews, it’s an invaluable resource.